Continuing the rejuvenation of Exeters Historic Quayside. Grainge Architects have submitted a planning application for a new restaurant on the Piazza Terracina, Exeter Quay to expand on and continue the redevelopment of Exeter Quayside. This elegant new building has been purpose designed for Rockfish, the highly successful group of family run restaurants based on the South Coast of England. Mitch Tonks who runs the group helped the Grainge team develop the concept for this highly bespoke building. Early input from the Exeter Planning team has helped shape this building and it’s material treatment. The proposed single storey pavilion has been carefully developed to relate to its immediate context, echoing the sites former industrial past. It’s low horizontal engineered feel will ensure it modestly relates to the more dominant existing industrial warehouses & the former Electricity Generating Building, now a successful climbing centre. The building is conceived as two glass boxes connected via a stone clad central core. The flat roof will be planted with greenery ensuring its fifth elevation is comfortably integrated within its unique setting. 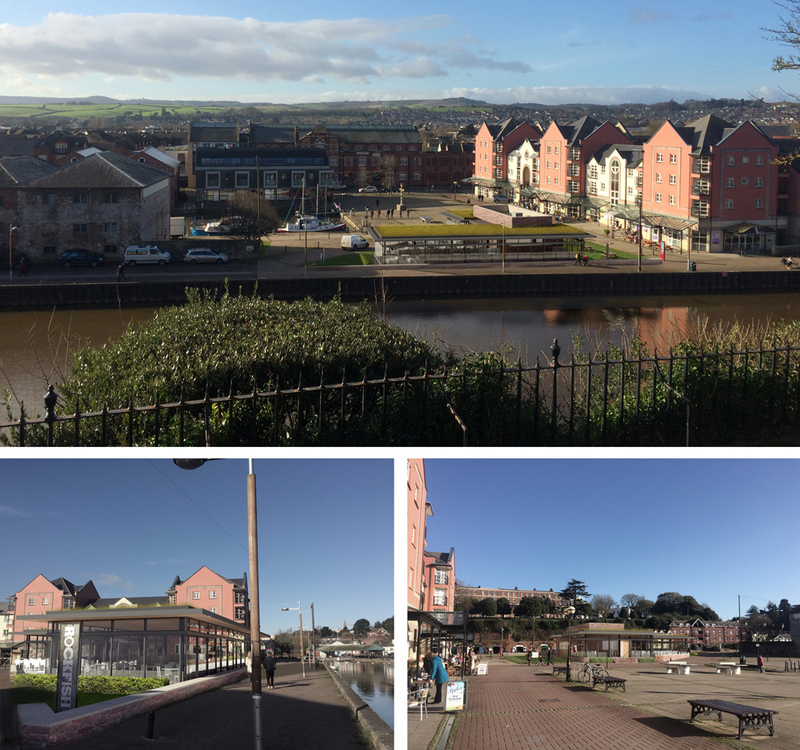 The buildings of the Listed Colleton Crescent will look across the River Exe down onto the scheme. The glass sides of the building ensure the existing piazza retains its open feel, allowing passersby to see through the building from the riverside walk through to the Exeter Ship Canal. Patrons of the restaurant will enjoy a near 360 degree view of the historic quay side area, whilst a sunny terrace will provide outside dining ensuring the building isn’t just a closed off development but rather, part of the quayside and Piazza. This development is proof of the continuing successful rejuvenation of the Quay area. Along with recent developments such as the Samuel Jones Pub & the Water Sports Centre this proposed contemporary building will add to the rich heritage of Exeter Historic Quay. This entry was posted in Community, On The Drawing Board and tagged Architect, Commercial, Devon, Exeter, quayside. Bookmark the permalink.